Named for the French exploring ship the Astrolabe, which was grounded and nearly wrecked there, the Great Astrolabe Reef is roughly 100 kilometers long and nearly unbroken but for a few small passages. Surrounding the Fijian islands of Kadavu, Ono and a few smaller islands to the north, it has a sheer shelf that drops off to several hundred meters which causes an upwelling of nutrients that is responsible for what may be the healthiest (legally) fishable waters left in the world. Many hours of my life had been spent trying to catch a yellowfin tuna. My patience was beginning to wain, and I was starting to think maybe I’d try to focus on something else, something that might be taken at a more sedate pace, like golf. Instead, and with sincere gratitude, my restless hunt for a tuna modestly culminated on a New Year’s Day in a small fiberglass skiff, hand over hand from a spool of monofilament line. Trolling at Twilight is Frank Waitzkin’s story of his aging family cruising the Bahamas in search of big game fish on the Ebb Tide, their 42-foot Hatteras sportfisher. Along with violent storms, dangerously shallow reefs, and unprecedented amounts of pollution, they encountered a severe lack of fish. For three weeks they trolled for big tuna and marlin, without so much as a strike. Just as the father (and author) begins to blame society and modernity for all of the ugliness it has cast upon the seas, luck begins to change and his reminiscing of and lamenting for his childhood quickly turn into a deep conviction for the present. After all, air conditioning, cable tv and penicillin aren’t all that bad. LATE IN THE SUMMER, a gentle southeast breeze nudges our vessel back to Florida from a trip to the southern Bahamas. I’d been right to expect a calm, reflective journey on the Ebb Tide, my old 42-foot Hatteras sportfishing boat. During our family’s past month at sea, there had been many adventures and fervent conversations to consider, along with evenings anchored out in the lee of a few lonely rocks, sitting on the bridge with a beer in my hand, feeling humbled by an epic, darkening sky. …As a kid, I began learning the nuts and bolts of fishing by walking the docks of places like Montauk, New York, and Bimini, in the Bahamas. I drove tough-talking captains crazy with my barrage of questions: Where’d you find them? What bait did you use? How far out did you set your lines? What was the tide? Early on I recognized that fishing captains were the real artists of the sport. Like magicians or visionaries, captains could find giant, fierce fish in the vast sea—they had dozens of crafty tricks for getting fish into the boat. Anglers were suckers who paid big bucks and sweated it out in the fighting chair, pumping and reeling. I idolized fishing captains like most boys idolized baseball players. Fred Waitzkin has written Searching for Bobby Fisher, Mortal Games, The Last Marlin, and The Dream Merchant, his first novel, which will be published in 2012 by St. Martin’s Press. 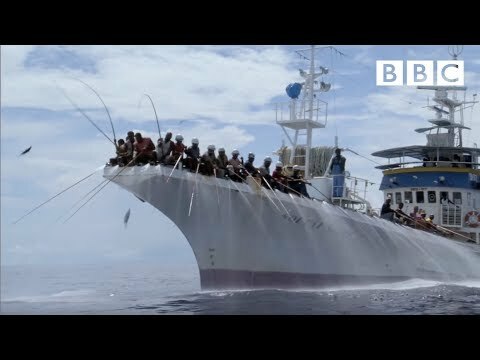 In an age where large netting ships can scoop up a season’s worth of commercial quota in a week, the age-old technique of rod and line fishing has become popular in the south pacific for skipjack and yellowfin tuna. Large-scale commercial vessels are now able to rig crew with long rods and fixed lines, with jigs at the end. To mask the presence of the boat, a mist is cast upon the surface, which also imitates schooling baitfish. Two yellowfin tuna race towards a flying fish and the one out front makes the grab. Yellowfin are one of the largest species in the Thunnus albacares genus. Usually found in schools with other tuna and sometimes porpoises, they inhabit tropical and subtropical oceans worldwide.